Heat oven to 350°F. In small bowl, mix graham cracker crumbs, butter and sugar. Press in bottom and up side of 9-inch glass pie plate. Bake 8 to 10 minutes or until golden brown; cool. In large bowl, beat milk and lime juice with electric mixer on medium speed until smooth and thickened. Fold in whipped topping. Spoon into cooled pie crust. Cover and refrigerate about 1 hour or until set. Store in refrigerator. If Key limes aren’t available in your grocery store, look for bottled Key lime juice near the other bottled lime juices. If you like flaky pastry, use Betty Crocker® pie crust mix to bake a single pastry crust in a 9-inch pie plate. Cool the baked crust, and add the Key lime filling. 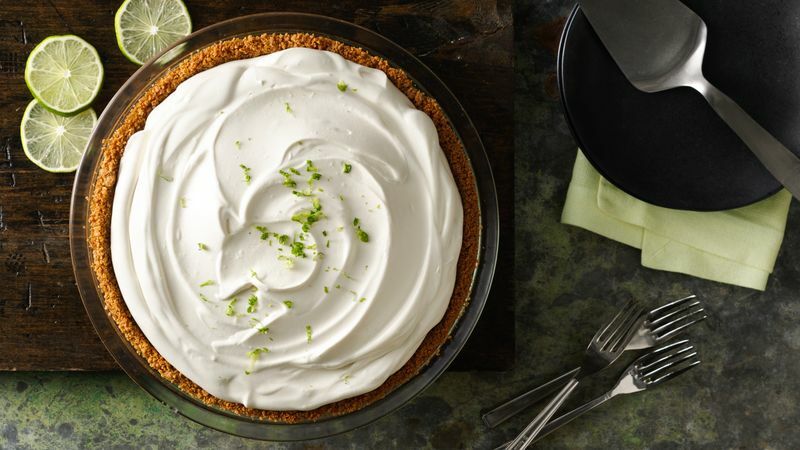 This easy key lime pie has all the flavor of the Florida favorite but with a lighter, fluffier filling. If key limes aren’t available in your grocery store, look for bottled key lime juice near the other bottled lime juices. Since the filling is not baked and gets its fluffiness from whipped topping, be sure to let the crust cool completely before filling. It is also important to let the pie chill in the refrigerator for at least one hour, so the filling has time to set and develop its full flavor. And if you prefer a flaky crust for your key lime pie, learn everything you need to know about making homemade pie crust. Then, explore the rest of Betty’s zesty and sweet key lime pie recipes.